CARDBOARD GOLIATH, a live action Virtual Reality film chronicling the construction of a thirteen foot cardboard sculpture of Ivan Drago (from ROCKY 4) by Los Angeles street artist, Calder Greenwood, experiments with the interplay between the actualization of the artist, the audio-visual information presented by the filmmakers, and the kinetic reaction of the viewer to create a mesmerizing artistic experience and cultivate a “plastic point of view”. We want to push the envelope of engagement of the audience to a physically active viewing experience directed through camera placement and editing choices to encourage an immersive cinematic dance. This physical interaction, we believe, is a critical technological step for audiences to develop the kinesthetics necessary to enjoy emerging VR, AR, and mixed reality interactive experiences. Johannes Birringer asserted that, “Interactivity, as a mode of technical mediation within a collective infrastructure, points to a new understanding of environments of relations and a relational aesthetics based on interhuman exchange or physical interaction, to a new technological kinesthetics. (Dance, the body and the internet, 2003). CARDBOARD GOLIATH situates the viewer in the environment of the artist, surrounded by his previous work, and in the midst of creation. The viewer is transported to the artist’s studio, to stand among astonishing pieces (a reproduction of a Japanese subway car; a capsule hotel; a giant tentacle that once emerged from a drainpipe at the Roslyn Hotel; an enormous wolfman’s claw; and a twelve foot Nicholas Cage from CON AIR), while observing the process of creation occurring (seemingly at arm’s length) before their eyes. The presence created by both the viewer and artist at work, interact to instigate a spontaneous performance curated by the filmmakers. The artist, Calder Greenwood, works in cardboard, a medium widely associated with virtual reality in the mind of the public through the Google Cardboard platform. We were inspired to create this film after being approached to make a Muay Thai boxing virtual reality film for a fight themed art show at Titmouse Studios Gallery in Hollywood. 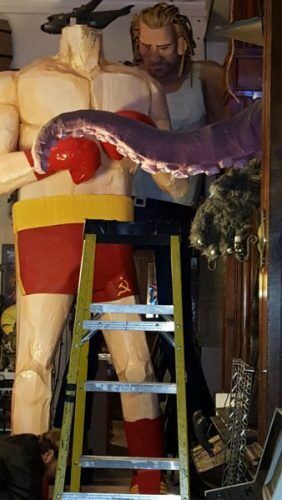 Calder Greenwood was about to embark on the construction of his Ivan Drago sculpture, and we thought the cardboard/virtual reality associations would be interesting to pursue. We captured Greenwood’s building the piece over the course of five days and nights, as well as the transportation of the large sculpture from the historic Indian Alley (adorned with murals by Shepard Fairey, Wild Life, Free Humanity, and many other celebrated LA artists) where Greenwood lives and works in Downtown Los Angeles, to the gallery space several miles away. The massive sculpture had to be divided in two pieces for delivery, and we invite the viewer to ride along with the bottom half of the sculpture through the palm tree lined streets towards Hollywood. Dpyx is the filmmaking team of Marcy Boyle and Rachel Holzman. Their first feature film, NOBODY CAN COOL, a graphic novel and film noir influenced thriller released in the USA/Canada in 2013, and UK in February 2016. Our interest in Virtual Reality stems from an aspiration to elicit a visceral response and explore alternative storytelling structures. In 2015, in advance of a screening they hosted of Marguerite Durasʼs film, INDIA SONG, they wrote an article for Indiewire referencing the virtual reality narrative possibilities suggested by Durasʼs hypnotic, enveloping masterpiece. Their first virtual reality film was a profile of two Muay Thai boxers that was shown at “The Art of Fighting” show at Titmouse Gallery in Los Angeles. CARDBOARD GOLIATH was shown as a work-in-progress at London’s first virtual reality Festival, VRUK, where Marcy participated in the Filmmaker Panel. Marcy was one of a hundred content creators invited to participate in Oculus Launch Pad. Dpyx is currently in the Green Screen Institute accelerator program developing Hot Bit VR, a virtual reality entertainment destination.